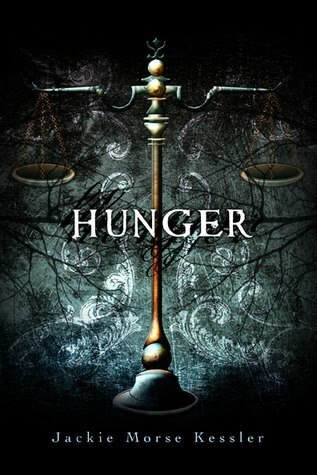 An anorexic girl becomes Famine, one of the four horsemen of the Apocalypse. This has the potential to help her see what real hunger (not self-induced) feels like, but it could also push her over the edge. I liked this realistic, raw book. It also had a touch of romance in it. However, eating disorders, which are the real subject, were protrayed honestly -if a little terrifying to someone who has no knowledge about them. It also had a redeeming theme, which I really appreciated and admired in the story. First of all, Death was protrayed rather immeturely as a rockstar, which I found shallow and irresponsible of the author. Death is not someone -or something- to be attracted to, to tap your fingers at his rythm. He's appalling, he's terrufying, he's ugly, he's dangerous. That's the main reason I think this book is highly innapropriate for teens. Second, the whole Apocalypse thing was not dealt with very precisely, as someone who has studied the Apocalypse and indeed the Bible would know. There were some very obvious mistakes. However, Famine and the whole Horsemen thing, viewn as a metaphor of our world's problems and pain, really worked for the book and for the story. Last but not least, there seemed to be a confusion between anorexia and bulimia, which I was rather surprised at, since the author claims to have been anorexic at one time herself. On another note, the girl's -Lisa's-relationhsips with everyone weren't expecially damaged, which usually justifies an eating disorder. She has a boyfriend who adores her and constantly forgives her, a beast frined who wants to help her even when pushed rudely away and a father who calls her princess. It's true that not only teens in problematic families succumb to eating disorders, but I would have liked to have seen more drama in her life. I really liked the ending of the book, the resolution so to speak, and the way every problem was dealt with. It's message is really encouraging and hopeful, and it made me glad to have read it. There are some very descpriptive scenes in this book, so maybe I would say it is not for the faint of heart. It is incerdibly realistic and honest and -for me- that is its main charm. There is a very interesting and funny interview with the author (taken by the characters of this and the next book in the series, Rage) at Figment Blog.